The court of law has been approached to order Army boss, Buratai to produce Nnmadi Kanu who is nowhere to be found since his house was invaded by troops. Leader of the proscribed Indigenous People of Biafra, Nnamdi Kanu, has been declared missing by his team of lawyers. The legal team led by Mr. Ifeanyi Ejiofor, said it had, therefore on Wednesday filed a suit before the Federal High Court in Abuja praying for an order directing the Chief of Army Staff, Lt.-Gen. Tukur Buratai, to produce Kanu in court. Ejiofor disclosed this in a text message sent to a Punch correspondent on Wednesday. “We just filed an application for prerogative order of habeas corpus commanding the Chief of Army Staff to produce Nnamdi Kanu in court,” the text message read. 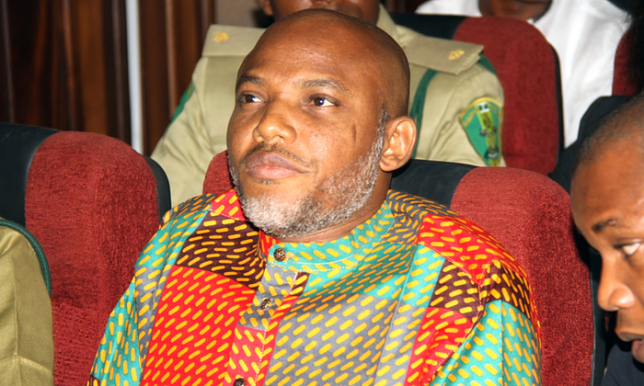 A draft copy of the motion which Ejiofor stated was filed on Wednesday stated that the Chief of Army Staff, was in the best position to produce Kanu in court. This, the suit stated was because, Kanu was last seen after soldiers, on September 14, invaded the IPOB leaders house in Afara-ukwu Ibeku, Umuahia Abia State, “on a murderous raid, where life and mortar bullets were fired on unarmed and defenseless populace, leaving 28 persons dead and abducting many” .